I hope you had a wonderful holiday season and you're ready for 2013. I know I am! 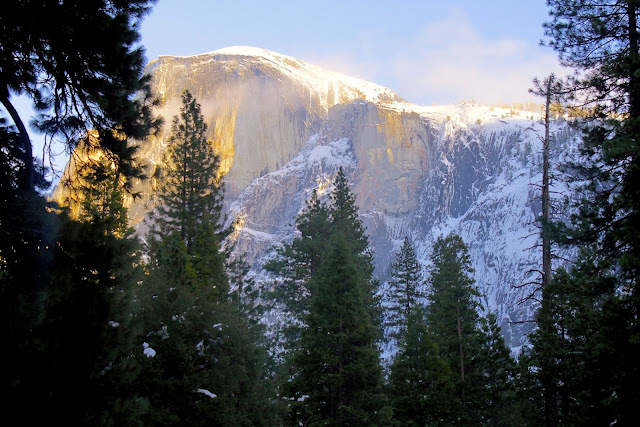 I'm starting off the year with an exciting 3-day jaunt to Yosemite for Chefs' Holidays at The Ahwahnee Hotel. I arrived yesterday and was welcomed into the park by a beautiful rainbow followed by a light dusting of fresh snow. I wandered around outside the hotel during sunset before the Meet the Chefs reception followed by dinner in the Grand Dining Room. I'm looking forward to today's chef demonstrations with Chef Douglas Keene (Cyrus, Healdsburg CA) and Victor Scargle (Lucy, Yountville CA) and tonight's dinner at Yosemite Lodge at the Falls. When I should have been finishing up my packing Saturday night, I was messing up the kitchen with this past week's French Fridays with Dorie recipe. I didn't find time to make this Herb-Speckled Spaetzle during the week and in time to post on Friday, but spaetzle is one of those side dishes you need to make, especially to go with Pork Schnitzel. For Dorie's herb spaetzle, you can use whatever combination of chopped herbs you prefer. I used parsley, thyme and rosemary. Dorie also sautés the cooked spaetzle with chopped onion and sliced mushrooms, but I left those out this time. Dorie shared her spaetzle recipe with Epicurious, so you can find it here. I had to add about 1/4 cup more milk to the batter for the right consistency to press through the holes in my strainer. I used Tyler Florence's Pork Schnitzel recipe, here. The only hard part about traveling is leaving Trapper behind. He hung out in the kitchen with me while I made dinner and I snapped a quick photo for all his Facebook fans. I'm sorry Trapper-boy, I'll take you to the snow some time soon. Spaetzle & Schnitzel... hmmm. This was my first time with the spaetzle - still haven't tried schnitzel. It's always hard to leave the dog behind. We have a favourite hideaway on the Sunshine Coast that's dog-friendly, which is nice for all of us. Your meal looks very traditionally German and a delicious combination. Yours spaetzle looks delicious and you choose the perfect menu combo. I hope you will write about your Yosemite experience. I envy you. Have stayed in the gorgeous hotel before (Autumn) but would love to be there in the Winter. Trapper is a doll. A lonesome doll but a doll all the same.